It is our great pleasure to welcome you all to the “20th Anniversary International Meeting of Korean Tissue Engineering and Regenerative Medicine Society,” which will be held at International Convention Center (ICC), Jeju from June 6 to 8, 2019. 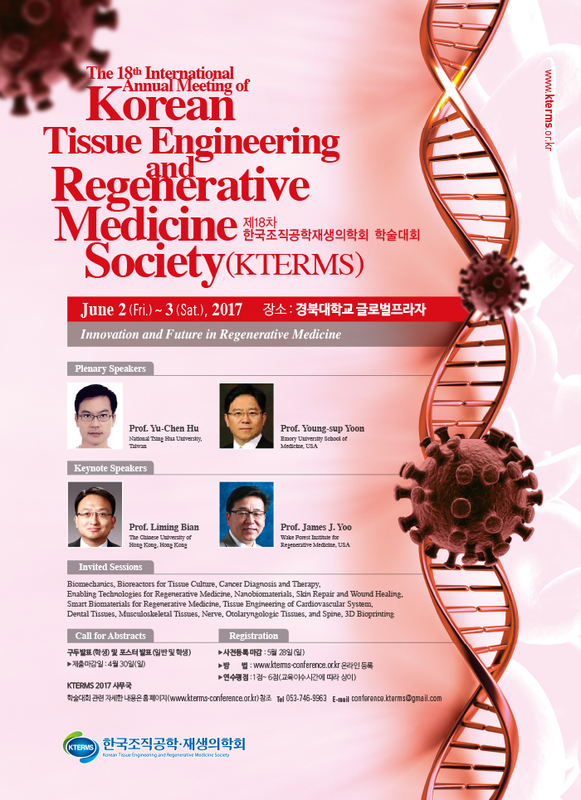 The Korean Tissue Engineering and Regenerative Medicine Society (KTERMS) had successfully hosted the World Congress of TERMIS 2009, TERMIS-AP 2014, and are actively taking part in TERMIS-AM and TERMIS-EU. Upon its 20th anniversary, KTERMS is preparing an International meeting under the slogan “A Big Step and New Challenges in Regenerative Medicine for Patients.” To celebrate this meeting, we invite three excellent scientists for plenary lecture and have special sessions including Korea-Taiwan symposium, Korean Women Science and Engineering session, We also plan on holding fascinating scientific and clinical sessions of various topics ranging from tissue engineering, smart biomaterials, convergence technology, nanotechnology, and enabling technologies for regenerative medicine as well as clinical applications of such technologies. Our members or non-members are equally encouraged to have chance to present their works with oral and/or poster presentation. We expect that the participants are actively engaged in and discuss the critical issues throughout this meeting, thereby taking chances for big steps to overcome challenges in regenerative medicine for patients. This meeting should promote the mutual understanding between experts and students who begin to learn and take their first steps in this area. We truly hope that this 20th Anniversary International Meeting becomes an invaluable opportunity that lays the foundation for more advanced development of Korea’s tissue engineering and regenerative medicine. We urge your continuous interest and active participation in KTERMS 2019, and look forward to enjoying this meeting and seeing you at beautiful island, Jeju very soon.